YAOUNDÉ, Aug 30 2012 (IPS) - Cameroonian urban famer Juliana Numfor has six plots of land where she grows maize, cassava, sweet potatoes and leafy vegetables, including cabbages, wild okra and greens. The soil in which her crops grow is moist and visibly marshy, and a stream of water runs near it. But if you take a closer look you will notice that the water is dark and smells unpleasant. In fact it is wastewater, which comes from a student residential quarter in Yaoundé, popularly called “Cradat”, that is less than 400 metres away from her plots of land. But it is precisely thanks to the wastewater that Numfor is farming on this public land. She told IPS that she prefers planting her crops on urban wastewater sites because she can easily irrigate them by using the readily available wastewater. She said that this was because rainfall had become increasingly irregular – coming and going when she least expected. “The kind of crops on this piece of land can grow on any fertile land if it is well watered. But during this period in August, which is supposed to be a very wet time of the year in Yaoundé, very little rainfall has fallen. It makes it impossible for vegetable crops to grow without proper irrigation,” Numfor said. And Numfor is not the only farmer doing this. Smallholder farmers around the Yaoundé city centre are increasingly farming on urban wastewater sites. While there are no official figures of how many people are farming in these areas, the Ministry of Agriculture and Rural Development (MINADER) admitted that the practice was overwhelming. 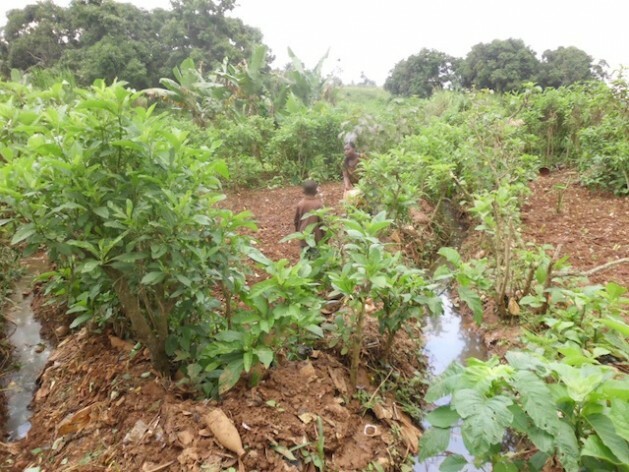 Smallholder farmers in and around Yaoundé can be seen planting their crops on public land, along railways, in conservation areas, and even near roads. “This is a long-time practice that has only intensified due to a lot of causes, climate change being one. Many farmers have resorted to urban farming with wastewater,” Collette Ekobo, an agricultural inspector at MINADER, told IPS. One 45-year-old woman told IPS that she knew 11 other women who cultivated crops on land near wastewater. “All I know is that the ground is very fertile. I think when people empty their sewers and other household waste into this water, it makes the land very fertile for farming. And there is water all season round,” she said. Rural-urban migration, aggravated by the adverse effects of climate change on rural farming, is thought to be one of the main reasons behind the growing number of urban farmers in the city. In 2011, MINADER began warning farmers about the climate variability affecting agriculture across the country. Yaoundé, which is located in Cameroon’s Centre Region, experienced reduced rainfall. “Over the years in Yaoundé, the rainfall pattern has been so variable and not easy to understand. Rainfall has become very irregular, unpredictable and reduced … this leads to prolonged dryness and the drying up of streams, accompanied by exceedingly hot climatic conditions – all of which provoke poor agricultural performance and low output,” the ministry said. Ekobo said that because of the changing climate, many farmers found it difficult to predict when to start planting. “The month of March traditionally marks the start of the planting season in the Centre Region of Cameroon, following the start of the rains. But due to changing rainfall patterns, farmers have now readjusted their planting periods, a phenomenon which is rather difficult to grasp a perfect mastery of. It has caused a lot of confusion with the farmers,” she said. She added that urban farming was integrated into the urban economic and ecological system of Cameroon. “The land is rich with urban resources like organic waste, which is used as compost, and urban wastewater, which is used for irrigation. There are also direct links to urban consumers,” Eboko said. But farming on urban wastewater sites is not a safe practice, according to Foongang Mathias, an agriculture expert at the Ministry of Environment, Nature Protection and Sustainable Development. “Wastewater irrigation provides the necessary plant nutrients, especially nitrogen and phosphorous that are required by crops for ample growth. But farming in wastewater poses both health and environmental threats, not only to the urban agriculturalists, but also to the consumers of the crops grown on that field,” he said. He told IPS that toxic waste from homes, hospitals and industries was probably deposited or carried into the wastewater. “This water contains pathogenic organisms and disease vectors similar to those in human excreta. Pathogens that are brought in with the wastewater can survive in the soil or on the crop and are responsible for human diseases,” he said. Despite the risks to her and her customers’ health, Numfor told IPS that the economic gains from farming in urban wastewater areas far outweighed the dangers. She will continue to sell her produce to customers, who include restaurant owners and retailers. Numfor said that she earned an average of eight dollars a day, but sometimes made more when she sold her crop to women who export Cameroonian vegetables to the United States and Europe. At a local market in Obili, a neigbourhood in Yaoundé, stallholders displayed large piles of vegetables that range in price from 200 CFA Francs (50 cents) to 300 CFA Francs (75 cents) per bunch. And consumers here did not care where the produce was grown. “I totally ignore the fact that they are grown in wastewater because even if they contain germs, the organism cannot survive in the pot with very high temperature,” one woman, who bought three bundles of bitter leaf or Vernonia amygdalina, told IPS. Meanwhile, Eboko said that the government did not plan to regulate farming near wastewater areas.